Images of select Charles M. Goodman works courtesy of the Robert C. Lautman Photography Collection at the National Building Museum, Washington, D.C. The Commons of McLean and Jacqueline Bouvier Kennedy had something in "common." They both resided in McLean, Virginia (just not at the same time)! 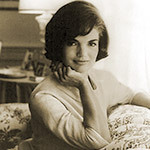 The former First Lady spent the latter part of her youth in the idyllic setting of Merrywood Estate in McLean, Virginia, overlooking the Potomac. According to writer Gore Vidal, a relation by marriage, she "tried to recreate Merrywood's heavenly ambiance" during her time in the White House. 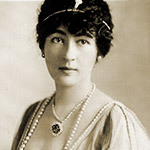 Evalyn Walsh McLean, daughter-in-law of John Roll McLean (namesake of McLean, VA), was the proud owner of the Hope Diamond. A wealthy gold heiress, she bought the infamous diamond from Pierre Cartier for $154,000 in 1912. The Hope Diamond is said to be cursed, and oddly she and her family did experience many misfortunes. The deep blue, 45.52-carat gem was also owned by actress Elizabeth Taylor prior to its current display at the Smithsonian. 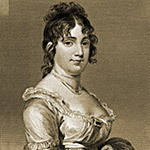 Dolley Madison was First Lady when the British overran the White House and set it ablaze in the War of 1812. As their army neared, the fearless wife of President James Madison, in his absence, refused to leave until she rescued George Washington's portrait from certain destruction. At the last moment, two gentlemen arrived to help, and she entrusted it to them with detailed instructions before embarking on a route that took her straight through Tysons Corner. 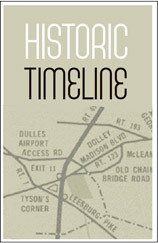 During the Civil War, the Union Army built a wooden signal tower at Peach Grove Stockade (now Tysons) in Fairfax County. They would wave a series of signal flags from that high vantage point so westward-moving Union troops confronting the Confederate Army could communicate with Union soldiers like themselves stationed in the east at forts defending the federal government in Washington, D.C. 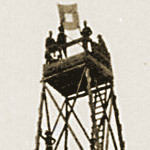 The photo is a typical signal tower in Civil War Virginia. In 1952, in the early days of the Cold War, the U.S. Army erected a classified radio tower on the same site in Tysons Corner where the Civil War signal tower once stood. This Emergency Military Communications System would be the main relay station between the President, the Atomic Energy Commission and various capital region military installations and defense communications facilities in the event of war. The tower is still maintained today by the Fort Belvoir Army installation in Fairfax County. 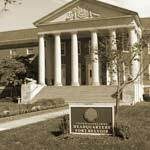 Shown: Fort Belvoir Headquarters (photos of tower are prohibited). copyright © 2015 An Uncommon Architect. All rights reserved. Any redistribution or reproduction of part or all of the contents in any form is prohibited.